Singlish and Literature – Are They Compatible? to take a photo of this Singlish in Sing Lit panel discussion. Note: the vulgarities and suggestive imagery in this article are white in colour. Please highlight to read if and only if you’re suitably mature. Like other dutiful classmates, I memorised chunks of prose and poetry by Shakespeare, Wordsworth and Susan Hill for the secondary school exams many years ago. Given the state-approved reading diet, I came to regard literature as a field that revolved around Western writings, with no room for our much-beloved Singlish. It was intriguing to flip through this year’s Singapore Writers Festival catalogue and discover an event listing - ‘Singlish in Sing Lit’. What a tempting title. With the expectation that this event would be poorly attended – after all, who would be interested in the niceties of Singlish? – I sauntered into the pavilion, almost ten minutes earlier before the event's start to avoid the glaring afternoon heat. And I was glad that I did for the panel discussion turned out to be so popular that there was barely space for latecomers to stand! Faith Ng, one of the three panelists and a playwright, invited two friends to perform an act from her For Better or For Worse. The poignant chatter between an unhappily married couple was spiced with Singlish. At this, the crowd dissolved into puddles of helpless laughter. Ng’s reasons for using Singlish in her plays are multi-faceted. When she was growing up, Ng saw plays with actors and actresses speaking in well-enunciated English and this didn’t reflect her lived reality. Using Singlish in her plays is not only a literary device to move the plot along with humour but also one way to represent and comment on the social fabric of Singapore. Then, Joshua Ip, a poet, shared four Singlish poems. When he first set himself the task to write one poem every day, Ip realized that he had to portray what he was familiar with. Should he have more time to write his poems, he might have chosen more exotic topics. However, given the tight time constraints he set for himself, Ip reflexively wrote about people and places in Singapore. So, why use Singlish in his poems? “Lam pah pah lan, lam pah pah lan,” Ip said with obvious relish. Such musicality, such rhythm, such wit! One testicular organ swinging and hitting another, before the latter swings back and collides in turn. At this point, almost everyone was convulsing with amusement. To be honest, the thought that such colloquial terms can have poetic beauty has never crossed my mind - up until Ip mentioned it. On the other hand, filmmaker Colin Goh thought that repeating adjectives might contribute to a more Singlish manner. “You see the fat, fat guy in the black, black shirt.” Everyone laughed because Goh was coincidentally wearing a black short-sleeved shirt. For one of his Singapore-based films, Goh had to replace all dialect vulgarities with the chirping of birds. Despite this very obvious self-censorship, the Board of Film Censors committee managed to find problems with his film. Goh noted the conflicting acts of allowing 11 audible uses of the F-word in a foreign movie and not even condoning a single bird chirp for a local one. Did this point to the gatekeepers’ double standards? Thankfully, all three panelists agreed there is a more liberal environment nowadays and the government appears to be leaving Singlish well alone. They paid tribute to the writers, playwrights and poets who had came before them and fought to present Singlish in the arts. One parent, a mother with three children and an English teacher, wondered how to reconcile Singlish and English, especially for young children who don’t know how to code-switch between the two. Goh said that our Channel 5 show times have been dominated by the American dramas for so long but we still don’t speak as though we’re from the suburbs of Los Angeles. Ng adds that we need to have confidence in our children, to trust that they would learn to use the languages in appropriate contexts. Ip noted that the best way for the government to stamp out Singlish would be to start a Speak Good Singlish Movement. This panel discussion was lively and wonderful, with three charismatic panelists who had meditated on the nature of Singlish. There was an atmosphere of good cheer, one that is difficult to describe with words now. Everyone seemed so relaxed and glad to be discussing Singlish in such a friendly manner. Why not show your kiasu spirit? Support the arts lah. 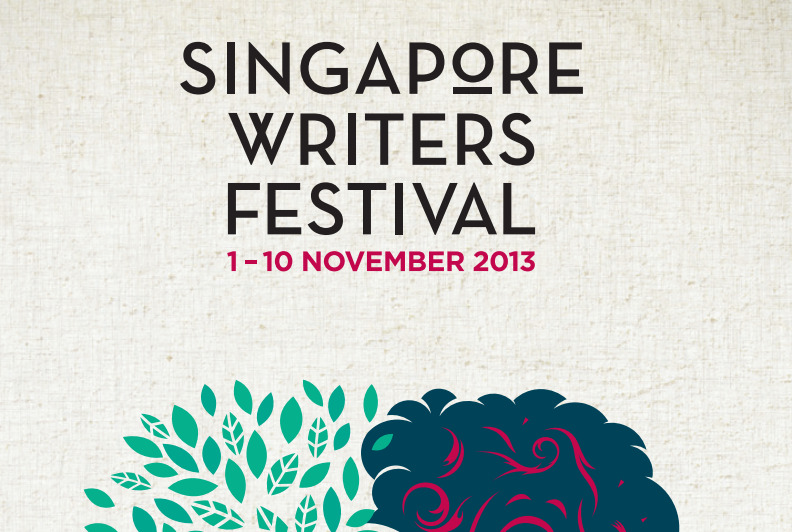 Buy a SWF2013 Festival Pass now and go for every event!